Please meet Watson! He is 1 1/2 years old & came to us as an owner surrender... He was not a fan of the new baby in the home. Watson will spending some time with a trainer to work on his behavioral issues. We will post more as we get to know him better. December 13 update: Watson is currently with our trainer working on some behavior issues. Watson (besides being food aggressive), is a love. As the trainer said, he's a typical bulldog: he's mouthy and stubborn and will tell you what he wants done; Feels he'll do best in bulldog experienced home who understands the breed. During our visit, Watson just wanted to play play play. He loves to play tug. Another issue he has is his collar/leash - he's not big on things going over top of his head. They're working with him on both things. Watson doesn't seem to mind other dogs; doesn't pay much attention to them and doesn't really bother them, either. The trainer said he wants to work with Watson for maybe another week or 2 on the food aggression and see where he's at. 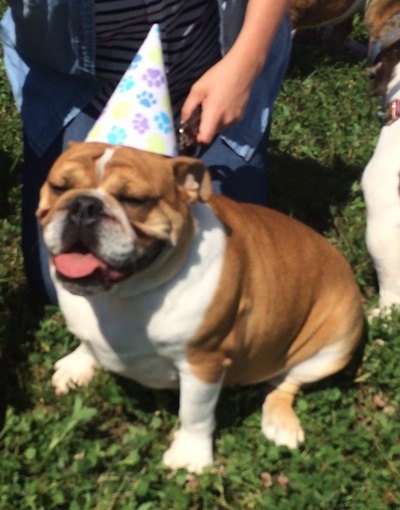 Again, Watson will need someone with bulldog experience preferred and definitely an adult home only. December 3 update: Watson will be spending some time with our trainer to work out some of his behavioral issues. Keep your fingers crossed everything goes well! 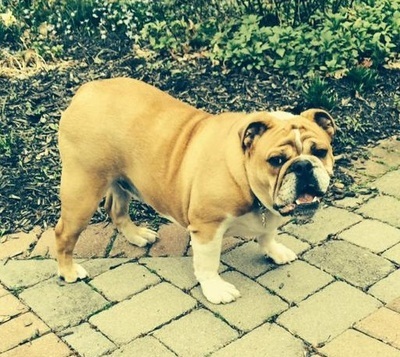 Please consider sponsoring Watson to help with his medical bills & trainer's fees.